Buzz!!! Buzz!!! Buzz!!! Your BlackBerry’s Alarm wakes you up to start another wonderful day, unless you’re having a case of the Mondays. You hop into the shower and go through your day in your mind, trying to remember all of the things you have to do. What party supplies do I need for this weekend? Does lil Johnny have everything for his Science Fair Project? What do I have to review again for CrackBerry.com? I’ll admit, I rely heavily on the ol’ MemoPad and Task applications. I think I have a bad case of Sometimers, my memory sometimes works. I can also admit that I’m easily distracted by anything new and shiny to me. One application, which may not be new to you, but is to me, caught my eye. 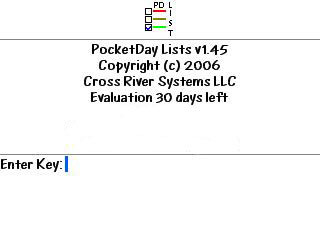 Cross River Systems presents PocketDay Lists, which is an excellent management tool for everyday use. It’s available on its own or a part of the soon-to-be reviewed PocketDay Professional Suite. I luckily had quite a bit of time to try this out, as it boasts a 30 day trial period. I even used PocketDay Lists to help me remember key notes about this application to share with you. My 30 day experience will take you less than 30 minutes to read. PocketDay requires that you run an OS of 4.1 or higher. You can easily download for Desktop Manager or go the OTA route. Once downloaded you are greeted by a My Lists screen. It’s ready, willing and definitely able to help you rid yourself of lists written on napkins and post it notes. 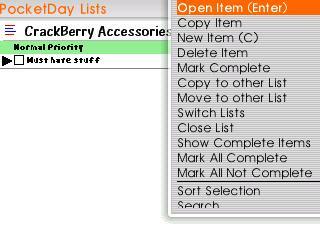 To make your life even easier, PocketDay includes built-in templates such as Tasks, Web Links, Mileage and shopping (say for Groceries or even your must have accessories from the CrackBerry.com Store). If you don’t find its templates quite helpful enough, you are free to create your own personalized template. As you embark upon creating the ultimate list made just for you, this handy appy gives you a few options. 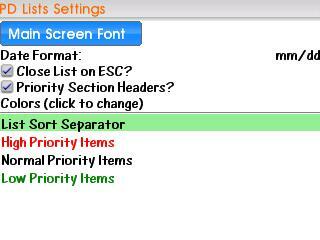 You can choose specific fonts that your BlackBerry already utilizes for each list as well as type of display, including due dates, complete/incomplete item listing. Choose priorities so you know what to tackle first. 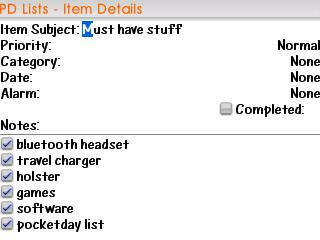 For more personal lists you can also set passwords, especially when it comes to your Holiday Shopping list. Within each field of the list there’s customization to be had as well. Choose from fields including URL, number, checkbox and time. The checkbox feature is a big bonus in my eye. Unlike good old MemoPad where you have to delete each item you complete, PocketDay gives you the option of checking off the completed items or hiding them when they are marked complete. This is a great feature, as I don’t find myself rewriting a list for next week’s grocery trip. Once you have your ToDo’s ready to go, you can choose to sort them by priority, category, due date, alphabetical or even sort them by how your crazy mind may work. If you are like me, you may need reminders, lots of them. Fear not fellow absentminded CrackBerry Abuser! 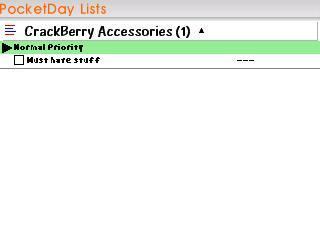 PocketDay lets you set up Alarms (with snooze features) to your lists, almost turning your BlackBerry into a nagging- I mean HELPFUL- significant other (love you baby). What would a BlackBerry Application be without the ability to email and share? PocketDay lets you email your information to anyone and import it into Excel. The only negative comment I can make is this; I love my BlackBerry Menu button. I’m so used to using this to open up menus. With PocketDay however, while it does open up the menu, I cannot click on a selection. The trackball is used to open and select option. It is a minor inconvenience, but one I can live with. The conclusion was the last item on my review list, yay I’m almost done!! 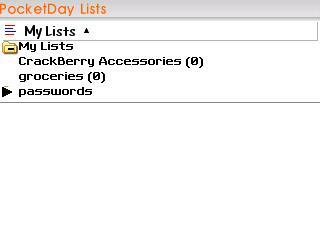 PocketDay Lists is a handy and necessary application to sport on your BlackBerry. It gives you the added oomph that MemoPad, to date, doesn’t quite give. It’s ability to create custom templates and email them off is huge. Just fix the Menu button issue (maybe they will catch this out of the corner of their eye and put this on their ‘to do list’) and PocketDay can add another great one to their bountiful bundle of applications. I can’t wait to try out the Entire PocketDay Suite. Although I find the price of $19.95 a tad high, some may find it worth it. 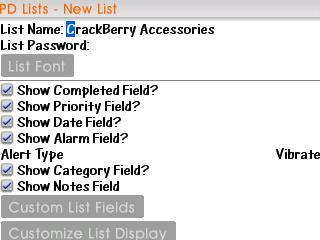 let me use my BlackBerry Menu button!! !